MPK Flexibles offers a full range of labeling options for every need. 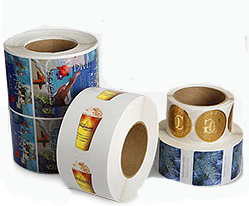 We print on films, foils, papers, adhesive and non-adhesive materials. We use flexography, screen and digital printing processes. We specialize in product decoration and informational labels that are vital for delivering your marketing and product message. Our labels are manufactured to tolerate extreme environments from water and oil to extreme temperature. Whatever the product, we have the label! If you need it, we can print it – any size, any quantity. Call us For A Quote! 845-473-3700.